O-rings or the O-ring contact surfaces. To ensure continued safe and reliable performance, always perform the maintenance after every diving session. same procedures to this product. 02, reverse the mounting procedure. shooting is less than in normal daylight shooting. FL reinforced glass, silicone and rubber (NBR). This product uses the following consumable items. using this product may pose a serious risk of injury and even death. Note : We reserve the right to change the external appearance and specifications without notice. Note : Images shot underwater using this product may be distorted at the peripheries. Lens Adapter (CLA-7) and Wide Conversion Lens (WCON-07C) with C5060 Wide Zoom Digital Camera. shooting at a wide angle of 30 mm* (when converted into 35 mm film, underwater image angle of approx. 70 degrees). due to the refraction index of water. Images shot underwater may be distorted at the peripheries. When this product is used in combination with the PT-020 waterproof case, the camera&apos;s built-in flash cannot be used. Unauthorized copying of this manual in whole or in part, except for private use, is prohibited. Unauthorized reproduction is strictly prohibited. occurring from incorrect use of this product. This case has been designed for use underwater at depth s up to 40 meters. This product must be used in combination with the PT-020 waterproof case. Do not use this product on its own. as damage to property. These pictographs and their meanings are shown below. Injury caused by dropping the product onto the body from a height. Injury caused by swallowing small parts. Please consult a doctor immediately if this happens. This product is partially made of glass. If it is broken or smashed, glass splinters could cause injury. Please handle this product carefully. take out the camera and lens. Do not disassembly or modify this product. This may result in injury. Silicone lubricant is not edible. Do not leave this product anywhere where it may be exposed to high temperatures. This could result in deterioration of its components. 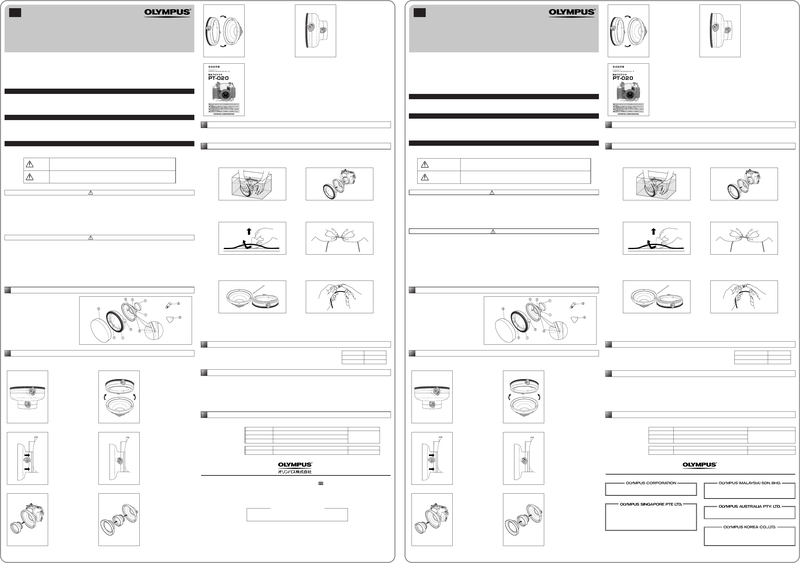 When mounting this product on the PT-020 waterproof case, follow the instructions in this manual. Before taking this product off the PT-020 waterproof case, make sure that the case is completely dry. of the waterproof seal and lead to water penetration. case, water penetration may occur. Before storing this product, always remove the camera and lens from it. Do not apply excessive force to the buckle used in attaching and detaching this product. remove any salt attached to it. Remove sand and dust from the O-rings. entire circumference to feel for abnormalities. the entire circumference of the O-ring.